Stay aware of yourself and your attitude. You may attract those who want to argue and prove that you are somehow in error. The experience could become an unpleasant memory if you let yourself get emotionally "hooked" into proving who is right. Travel and legal activities are favored. For All Signs Saturn and Chiron are "pulling" at us from opposite directions. This is the sixth in a series of seven aspects which began in Sept. 2003 and will conclude in June of '06. During this period of 33 months, we are called upon to confront our dark side, the one that can wound others in revenge for past injuries. We can choose how to react to the energy. We can live in fear and strike at our enemies. It is the inner critic who urges attack. Kill or be killed. Or we can imagine how it would be in the other pair of shoes and open our hearts to the possibility of healing. The challenge is now and the choice belongs to each of us. Aries You are bringing old things to a conclusion so you can begin in new territory. During the next seven weeks, your actions will be intensified in the life sectors related to vehicles, short distance travels, errands, communications, education, your neighborhood, and siblings. Taurus This is a fine week for love, social life, romance, and travel. You are in an optimistic frame of mind. Activities involving the law, education and publishing are also favored. The only drawback this week is your strong temptation to go overboard with expenses or cheating on your diet. Gemini This week you will thoroughly enjoy your work and coworkers. Mental projects are a challenge. You have chosen to be in the background for several months, but now you are moving back out into the world. You have been the observer for quite awhile. Now you become outspoken. Cancer Your work in the world is highly active and requires considerable initiative. Fortunately you have quite a lot of the required energy to make things happen. Sometimes you are extroverted and other times you are withdrawn. The flow is outward now and many are benefiting from your attention. Leo An error made in Nov. 05 (or even several months before that) becomes apparent. Make an effort to step aside from an argumentative reaction to the problem. You could become so overly invested in being right that you create disharmony over a small issue. Relax. Virgo You have a mixed bag of aspects this week. In those encounters where someone is nitpicky about details things will not go well. In other relationships, where you have the privilege of being in touch with your feelings, your communications flow smoothly. Libra Your home, hearth, and family members may be special sources of joy this week. You will be taking pleasure in your appreciation for art and beauty. Perhaps you will be decorating or rearranging the objects in your life so they can make you smile for many weeks to come. Scorpio You are finally able to see daylight and the end of a long cycle that began last July. Your attention will begin to shift toward issues of intimacy, joint and corporate financial matters, taxes, and/or estate and business planning. You will be whittling away at debt. Sagittarius This is a wonderful time to kick back and smell the roses. You could have a perfectly wonderful time in the sanctity of your home, if you give yourself a chance. You have a greater than normal appreciation for art and things of beauty now. Capricorn Read the lead paragraph carefully. This particularly pertains to Goats. Your physical health may be at issue and it is important that you open yourself to the most healing option in the nearby (or even distant) environment. Seeking compromise is favored. Aquarius You have been undertaking a long and stressful journey with your partner. The details of the story varies among people. However, in some way your partner is experiencing considerable trauma and you must decide how much or how long you can continue to be supportive. Are you interested in a personal horoscope? Vivian Carol may be reached at 704-366-3777 for private psychotherapy or astrology appointments. 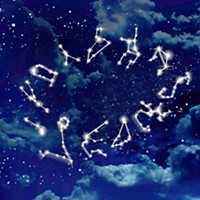 Web site: http://www.horoscopesbyvivian.com.